Tim Burton is about to make a much welcomed return to the world of stop-motion animation with his upcoming film Frankenweenie. For a young boy named Victor (Charlie Tahan) who loses his dog and best friend Sparky, life is tough. That is until he is inspired to bring his four legged companion back from the dead, an event that could lead to all hell breaking loose... quite literally! With a story that is clearly based on Mary Shelley's classic gothic horror Frankenstein, Tim Burton's new film Frankenweenie is also based on another source: a film called Frankenweenie by Tim Burton! Yes you read that correctly, although the explanation behind this is hardly Inception worthy as you may think; back in 1984 a young Burton made a 30 minute live-action short film of the same name. Now nearly 30 years on, and Tim Burton's ambition to make turn his classic short into a full length feature film has finally been realised. 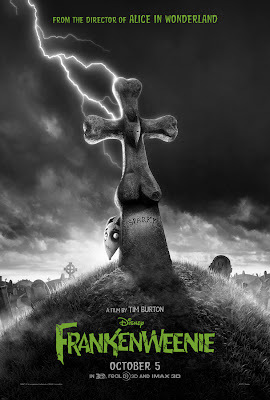 Frankenweenie is released in cinemas across the UK on October 17th 2012. Glad to see Burton resurrect Frankenweenie, or should he stay dead and buried? Will it be a blockbuster or lacklustre? Leave your comments below!